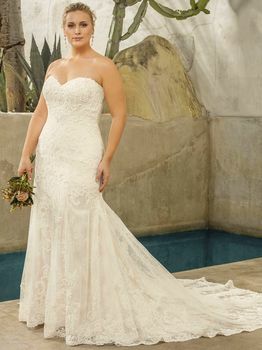 Varying scales of lace combine in a unique way across the strapless, fit and flare frame of Style 2294 Avery. The perfecting satin underlay simply reaches a chapel length, while Chantilly lace fans out in a semi-cathedral length addition. The option of a removable panel reveals an illusion back.